London is a city of gardens large and small, but the Chelsea Physic Garden is unique in being the oldest botanical garden in town. Founded in 1673 by the Worshipful Society of Apothecaries it has over 5000 plant species and is a Grade I Site of Borough Importance. The largest outdoor olive tree in Britain grow here and the pool rock garden, built from stones that include Icelandic lava, is the oldest in Europe. Visitors to this "Secret Garden" can encounter plants used in Ayurvedic medicine in The Garden of World Medicine, a display that shows how plants are used by cultures around the world, and in The Pharmaceutical Garden can be found plants such as Digitalis lanata (Woolly Foxglove) which is used to make digoxin, a drug that strengthens the heartbeat. The Historical Walk honours the best known people from the Garden's past including Sir Joseph Banks and Robert Fortune. And as well as the Garden's flora there's the fauna - wildlife that includes the song thrush, pipistrelle bats, and the dragonfly. 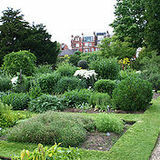 The Garden also offers Summer Lectures on subjects including Scents of History: Perfumery in Britain, and adult learning courses that cover such topics as organic pest control, the history of herbalism and a garden inspired creative writing workshop, as well as the popular Compost Clinic. On school holidays there's Family Activity Days - Creepy Crawlies introduces creatures like the hissing cockroach and the corn snake and Chocolate Tuesdays are all about Sir Hans Sloane, the man who brought the recipe for chocolate from Jaimaca and include, of course, a chocolate tasting. Relaxing but facinating, this very special garden should not be kept a secret.